David Jones is a project foreman at United Structural Systems, Inc. 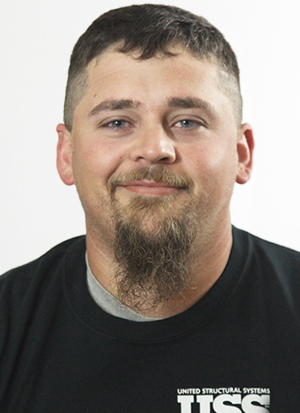 Prior to joining USS in 2015, David worked as a residential framer, heavy equipment operator and tradesman at Case Cutlery. One aspect of his job that he enjoys the most is the customer’s reaction to the correction of their home or workspace. Originally from Fillmore, NY, David currently lives in Clarksville, TN with his wife of 10 years. Together, they have five children, three grandchildren and two English Bulldogs. In his spare time, he enjoys playing semi-pro football (TE/RB) and making knives.